The biggest event that we took the RL28 to was the Geelong to Queenscliffe race for trailable yachts. At this time we were very busy at work and trailable yachts were enjoying a boom, and there were some hundred or more different types being built. I just couldn't get away to take the boat down to Geelong for the weekend, so June agreed to take over that job with the help of one of our staff, and I would fly down on the Friday evening and meet them there at Geelong. I had never seen so many sailing boats in one place. The race was run in nine divisions. The first class was sent off at 8:55 AM and our division started last at 10:05. There were 45 entries in our start, and 217 boats had started ahead of us, making a total of 263 boats in all. By the time we got to the line, boats were spread right out all over Corio Bay as far as we could see. Apache 11 proved to be almost unbeatable in the light conditions, and passed 255 boats in the seven and a half hours it took us to complete the course. We finished 6th over the line and were only beaten by boats that started in divisions well ahead of us. Only 110 boats finished the race and 153 either failed to finish, or finished after midnight. 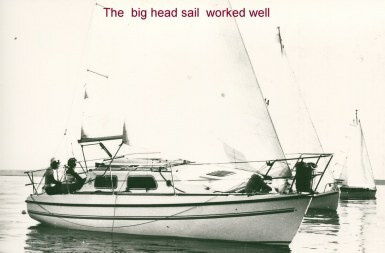 We were well satisfied with the results of a boat that was never intended to race, and pleased with the creature comforts on board. Now we had to think of other things, there was the RL24 to upgrade, and in the back of my mind there was a boat around 34 ft in length.